Is there anything worse than bitterly cold winter air? When a regular winter coat just isn’t warm enough, a heated jacket might be the answer. I know it makes a big difference for me! Are all heated jackets the same? Not even close. Some of the heated jackets out there are terrible and are not worth buying. I’ve tried a lot of them and done hours of research, allowing me to separate the good from the bad and the safe from the dangerous. Read this guide to make sure you find a jacket that will actually keep you warm and safe. A sleek and attractive coat, this battery-powered jacket from Milwaukee brings heat to the chest, back, and even the hands. You are able to adjust the level of heat to each zone separately. If your hands are freezing, you might want to crank the pocket heat zone up to the maximum level while keeping the chest and back zones at a lower level. You would make this adjustment with the simple LED controller. Insulation helps to trap heat within the jacket as well. No battery is included with this jacket but it’s compatible with all M12™ REDLITHIUM Batteries and all M18™ REDLITHIUM™ Batteries. You can expect a decent runtime with these batteries of up to eight hours. In addition to the sleek design and superior heat functionality, this jacket offers a shell with wind and water resistance. The ToughShell™ Stretch Polyester is also extremely durable. Milwaukee claims that it will last five times as long as a typical jacket. You might think that a heated jacket would be restrictive. While some certainly are, this Milwaukee jacket offers excellent mobility thanks to the FreeFlex™ Mobility Gussets. You are also afforded some customization for fit with the adjustable cuffs and the drop tail extended back. Verdict: The Milwaukee M12 heated jacket is the best on the market with its ultra stylish design, superior heating, and excellent mobility. Let’s face it – most heated jackets are a bit utilitarian looking. They get the job done and keep you warm but you don’t necessarily feel attractive when you wear them. For the fashionista who is always cold, the heated jacket from Ravean is a great option. This jacket is made from really high-quality materials like down that meets the Responsible Down Standard. It’s incredibly lightweight and packable and it even comes with a little bag to pack it up in. The jacket is very breathable and the outer layer is coated with a water-resistant coating, something very nice for dreary winter weather. There is a hood that is adjustable and even removable. The faux fur on the hood adds a nice touch of style so many women will choose to always keep the hood attached. When it comes to the heating factor, this jacket gives you quite a bit of control. You can select from low, medium, and high heat that you control with a simple button. This jacket will keep you warm and toasty in temperatures ranging from -10F (-23C) to 55F (12C). There is also, of course, the option to turn the heat off altogether so you’ll still be able to wear this coat even on days that are a bit warmer. 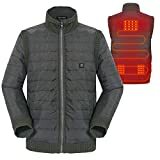 The jacket has multi-zone heating areas. You are able to select which of the areas (back, chest, and pockets) you want to be warmed up. You can heat all of the areas at once or only apply heat to one or two selected zones. Since the jacket uses battery power for the heat, there is the super convenient bonus that you can charge your mobile device right from your jacket, even while the heating element is on. The battery has enough juice to fully charge a mobile device up to three times. That said, the heating element will eat up the battery life quite a bit faster. On low heat, it will last around 6.5 hours but on the highest heat setting, it will only keep you warm for 2.2 hours. This jacket is 100% washer/dryer safe. Verdict: The Ravean Women’s Down Heated Jacket is pricey especially considering the fact that you have to buy the battery separately but it is without question one of the nicest looking heated jackets on the market. It’s beautifully made from high-quality materials and it gives you flexibility and control with your heating. If the style of the Milwaukee M12 is a little too formal for you, the Milwaukee Heated Hoodie is an option that will keep you warm and toasty in a cool, casual style. This makes it ideal for things like tailgating and campfires. This is essentially a zip-up hooded sweatshirt with the addition of heat. The exterior is a soft and comfortable cotton. It uses a M12 REDLITHIUM 2.0 Ah Compact Battery Pack which is unfortunately not included with purchase. The battery will give you up to six hours of heat. A waffle weave interior lining helps trap the heat within the hoodie. You are able to adjust the intensity of the heat with the touch of a button. There are two carbon fiber heating element heat zones, covering the chest and back. Like the M12, this heated hooded is surprisingly flexible and lightweight. Milwaukee’s use of a number of unique proprietary materials also make this incredibly durable, certainly more durable than your average hooded sweatshirt. This hoodie is safe in both the washer and the dryer. Verdict: The Milwaukee Heated Hoodie offers decent warmth in a comfortable and casual style. This is a warm and attractive jacket that is loaded with convenience features. 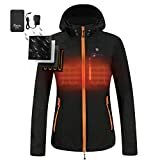 Tailored specifically to comfortably fit active women, it sports detachable sleeves, standard USB port charging, push-button heat control, and a 5V/2.1A adapter. This is one of the more user-friendly heated jacket options out there. It’s compatible with any standard USB power bank and can be battery operated as well. We also like the way that the sleeves detach so it can be turned into a vest. This makes it a great option for watching hockey games, hiking, outdoor leisure activities, and more. Also, it’s an extremely good looking jacket so you won’t have to sacrifice style for utility in any way. The anti-pilling material that it’s constructed of allows for lots of motion. 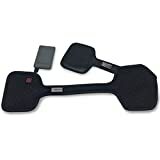 It can be worn snowmobiling, skiing, climbing, or anywhere that you may find yourself on-the-go. The warmth radiates through the core of the jacket to help you keep your temperature comfortably controlled for hours. Choose from five different heat level settings ranging from 86º-122º Fahrenheit. Design elements include a classically high neckline, styled contouring, and a versatile slate gray color. Still, this jacket has a few disadvantages. First of all, it doesn’t have the durability or heat that may be needed for certain outdoor working applications such as industrial or construction sites. For this, you may wish to go with one of the Makita jackets out there. Additionally, it tends to run small. You’ll definitely want to order a jacket that’s one or two sizes larger. Still, it’s stylish, convenient, and easy to use. Attractive – Has a very attractive and stylish design. Comfortable – Warm and comfortable enough for many different activities. Detachable sleeves – The sleeves detach and make this jacket into a heated vest. Adjustable – It has 5 adjustable heat settings which allow you to get comfortable easily. Medium-range quality – This jacket wouldn’t work well if worn on a construction site or in an industrial workplace; it isn’t for intensely rough or cold situations. Runs small – This jacket does not run true to size. Verdict: If you’re a woman who is looking for a comfortable jacket that can keep you pretty warm and also looks great, this is an awesome option. If you want something to wear on a construction site or somewhere similar, this may not be the best option. It simply isn’t cut out for intense cold or strenuous situations. However, if you’re looking for a stylish heated jacket for your leisure fall or winter activities, this jacket is fantastic. Just be sure to order it up high if you wear a size L, XL, XXL. Hunting is a beloved activity for many but it can sure be cold! 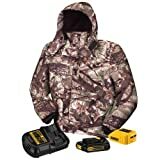 This Dewalt Camo Heated Jacket will be of great comfort to the hunter spending hours in the deer stand. The camouflage design makes it popular not just for hunters but for outdoors enthusiasts of all types. The outer camo shell is water resistant, making it great for snowy weather. There are four heating zones including two different chest zones, mid-back, and collar. There are three temperature settings available for each zone and you control the heat settings with an LED controller. You’ll get up to seven hours of heat with the 20V MAX Battery. The battery and charging unit do come with the jacket. There is even a pre-heat function to get the jacket nice and toasty before you even put it on. Pockets are an important feature in jackets but you often won’t find too many in heated jackets. This is an exception with seven pockets to hold everything you need. There is an inner left chest pocket that is perfect for a cell phone and the battery unit even has a port for a USB cable so you can charge your phone. This would obviously reduce the total heating time of the jacket but it’s an incredibly convenient option. Another nice feature of this jacket is the removable hood with neck and face guard. Verdict: The hunter or outdoor enthusiast will feel right at home in this warm and water-resistant Dewalt Camo Heated Jacket. A major perk of this jacket is the number of pockets. This is similar to the Dewalt camo jacket but with a classic, black design and a few less options. The water-resistant polyester outer shell is soft and comfortable and looks great. The cuffs and waistline are adjustable to help you get the best fit possible. This jacket has five pockets. One pocket is perfect for a cell phone and you can conveniently plug the phone into the USB port on the battery for charging on the go. The jacket does come with a 20V/12V MAX USB Power Source, a DCB201 20V MAX Battery, and a DCB101 20V/12V Charger. You’ll get up to 24 hours of run-time from the battery, though it will be less when using the highest heat settings. For each of the four heating zones, you have three levels of heat. There is also a pre-heating option. 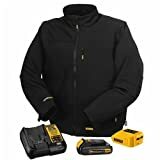 Verdict: The Dewalt DCHJ060C1 Heated Jacket Kit offers a simple black design, several pockets, and easy-to-use heat functionality. The Makita DCJ200 doesn’t provide as much heat as other jackets but it’s still a decent option. It’s probably not for you if you’re often in extremely cold situations bit if you’re just looking for a bit of extra warmth, this jacket should serve you well. One thing that really makes this jacket stand out is the separated sleeves option. You can remove the sleeves altogether and just wear this as a vest if that’s you’re layering style. There are three heating zones on the jacket, two in the chest and one in the back. The chest zones are a bit lower than you’ll see in other heated jackets. This positioning actually helps to make the pocket area warmer. While there is no dedicated hand warmer in the pockets, you’ll get decent warmth there thanks to the chest heat zone position. In each of the heat zones, you can set the heat to high, medium, or low..
Heat comes from the Makita 18V LXT and 18V Compact Lithium-Ion batteries. You can buy the BL1850 battery separately which will offer you an astounding 28 hours of heat, the longest duration you’ll find. This battery will be pretty bulky, however. To help keep you warm, there is a soft fleece-lined collar. There are also storm cuffs and a drawstring waist to help close up all areas where cold can leak in. Verdict: The Makita DCJ200 is a unique heated jacket that gives you the option to wear it as a vest with separated sleeves but it only offers a minimal level of heat. Like the Milwaukee Heated Hoodie, this hooded sweatshirt from Ororo offers warmth in a comfortable and casual style. Although it has the design of a hooded sweatshirt, it’s not like the Milwaukee one in that it looks more like a jacket. It has a 100% Polyester water-resistant DWR coating that makes it waterproof and windproof. There are two design options, white and navy, both of which have a subtle camo design. The fabric is quite durable and the jacket is washing machine safe. Carbon fiber heating elements bring warmth to three zones in the chest and back. For each zone, you can set the heat to high, medium, or low, with the touch of a button. Heat is powered by a 7.4 V, 4400mAh Battery and you’ll get up to 7 hours of warmth. The battery has a USB port so you can also use it to charge your electronic devices like cell phones and tablets. Verdict: While the Ororo Cordless Heated Hoodie isn’t quite as warm as some other jackets, it has as a nice design and some convenient features. It’s also a good unisex choice with sizing options that will work for both men and women. This vest is a good option if you don’t want the bulk of a full jacket but you’re still looking for some added warmth during cold weather events like tailgating and bonfires. This vest can really take your layering game to the next level. It would work really well for activities like skiing, worn underneath your regular ski or winter jacket. The layering approach with a heated vest will ensure that you are truly toasty. It has a sleek, attractive design and it is truly a unisex option with sizing available for both men and women. This is a super lightweight down vest with a soft polyester shell. Four carbon fiber heating elements bring a good amount of warmth to the collar, left chest, right chest, and mid-back areas. There are three levels of heat you can choose from and you’ll get up to 131℉ on high. You will get up to eight hours of heat with the 7.4 V, 4400mAh battery. The battery does have a USB port so you can also use it to charge electronic devices like cell phones. As a safety precaution, this jacket uses a multi-step safety system. Short-circuiting is unlikely to begin with but this system makes sure to protect you from this happening. You’re also protected with the 1-year warranty that covers the entire jacket. 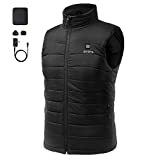 Verdict: The Ororo Heated Down Vest is lightweight, attractive, and an effective heat source. Most heated jackets, even the unisex options, are pretty masculine. This jacket from Outcool is designed specifically to fit a woman’s body. It’s a stylish, form-fitting black with orange accents. This jacket has three heating zones in the chest and back. While most heated jackets only give you three levels of heat, this jacket lets you choose from four heat settings. The included 7.4 V, 5200 mAh battery will keep heat the jacket for up to eight hours. It can also be used to charge your electronic devices like cell phones. Speaking of cell phones, there is adequate storage in this jacket for your phone, keys, and whatever else you might need. There are three zippered pockets. The zippers on both the pockets and the main zipper meet the YKK international standard for zippers. If comfort is important to you, you’ll be satisfied with this jacket. It is lined with luxuriously soft polar fleece. The soft outer shell is both waterproof and windproof, helping to keep you warm even in poor weather. This jacket is a good option for a variety of outdoor activities, including active endeavors like skiing. 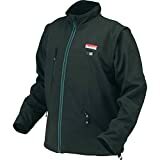 This is a very durable jacket and it is machine washable, thanks to the use of durable fabrics. It also offers a 24-month guarantee. Verdict: For the woman looking for a stylish jacket to keep her extra warm, this Outcool jacket is a great option and offers excellent value for the price. I name it the best heated jacket for women! This heated hoodie from Duran is one of the cheapest options you’ll find. It has some serious promise but it’s not without its problems. 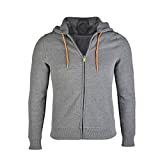 For a hooded sweatshirt, it’s quite stylish with its tailored gray design with orange drawstrings and ribbed cuffs. This hoodie offers three zones of heat, using radiant heating technology. You control the heat using a simple thermostat. The heat is powered by a 5V USB Power Bank system, stored in an interior pocket. Unfortunately, the power bank is not included with purchase of the hoodie. You’ll get up to eight hours of heat from a single charge of the battery. You are also able to charge your phone or other electronic devices on the go. As of the time of this writing, this hoodie has only a single review on Amazon and it’s not great. The primary complaint is about the sizing. As the reviewer complains, this hoodie isn’t true to size. Although one of the selling points of the jacket is its slenderizing tailored fit, they run big. For most people, ordering a size down from what they typically wear will be the right size. If you like your sweatshirts to be a bit looser or baggier, just order the size you usually wear and it will probably fit just right. Verdict: Even without a battery being included, the relatively low-cost Duran USB Heated Hoodie offers great value and a lot of promise along with a stylish design. We all have that one jacket that looks amazing but simply isn’t warm enough. Wouldn’t it be nice if you could find that same jacket, but with adequate heating capabilities? If you have experienced this issue or similar issues, we have the solution for you. With the Torch Universal Coat Heater, you’ll have access to all of the comfort and convenience of an electrically heated jacket with more versatility and flexibility than ever before. This is a small, yet powerful battery-operated coat heater that can be used with essentially any coat or jacket! You’ll get all of the benefits of a heated coat without being limited to a single garment. You can remove this compact heating device and use again and again wherever you go. It fits easily inside the lining of your coat or jacket and includes a custom Velcro installation kit! It can be used in multiple coats and stays in place reasonably well as you’re out and about. It works best with coats or jackets that have polyester linings of some kind. Heat can be adjusted with the press of a button. Choose from three effective and comfort-inducing heat settings. You can also place the Torch Coat heater in a few different places. It can be put higher up for heat on the shoulders and upper back, or lower down to warm your core and keep your lower back relaxed and warm. This heater works well for snowboarding, skiing, hockey games, strolls through the winter snow, walks on a chilly autumn evening, and more. On the downside, this heater only lasts a couple of hours with the provided battery. The rechargeable Lithium Polymer battery will need to be recharged after each excursion. Still, it’s an innovative heating solution that can keep you toasty warm in various situations. Versatile – You can use this heater with nearly any coat or jacket, especially if they’re polyester lined. Compact – Compact and lightweight, this heater packs a punch. Heats fast – Heats up quickly and can be set to three different heat settings. Easy to use – Push button controls and a Velcro installation kit help to make this heater simple and effective. Only around 4-hours of battery life – Will usually need to be recharged after each excursion, especially those lasting 3-hours or more. Verdict: At last, you can take full advantage of all of the coats you currently own! Easily warm up any stylish jacket and get the most out of your wardrobe, all with one smart product. It will need to be recharged after every two or three hours of use, but we feel like this is a fair price to pay for such a versatile outer garment heating solution. Wires, typically carbon fiber wires, are placed in certain areas within the fabric lining of the jacket. The special heating element wires are connected to a battery via an included cable. When turned on, the wires heat up. Radiant heating works by spreading the heat throughout the area. Carbon fiber is flexible and lightweight, making it ideal for fitting comfortably in a jacket’s lining without restricting movement. Because these jackets use battery-powered electricity, it’s only natural to worry about the risk of fire or burning or even electrocution. However, you don’t need to worry about these problems. The jackets on this list are all perfectly safe. This is largely because the voltage used in these jackets is so low, similar to what is used to power a small electronic toy. There is certainly no risk of electrocution. Things like overheating and catching fire can be a concern with some heated jackets that have poor wiring. That’s why it’s incredibly important to do your research before making a purchase. I’ve looked into all of these jackets to make sure they are safe but the quality of construction just isn’t good enough on some other jackets. Don’t buy a heated jacket with a really low price tag without making sure it won’t be dangerous. Even with the jackets on this list, though, you should always carefully inspect the jacket before using it to make sure it doesn’t look like there is any frayed wiring or anything else potentially problematic. If you do spot something, it’s important to contact the manufacturer right away. Can you wash a heated jacket? In most cases, yes. Most of these jackets are safe in both the washer and dryer. This is because they are made with durable fabrics and durable carbon fiber heating elements. The only thing you have to do is remove the battery pack. The battery should never be washed. Is there one with heated pockets? The Milwaukee M12 is the only jacket on this list that has heated pockets, which is what makes it my favorite. Cold hands are one of the worst parts about doing anything outside during the colder parts of the year. Gloves are okay but there’s nothing quite as effective as a heated pocket. 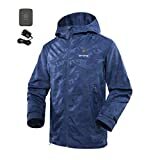 You will feel some heat in the pockets with some of the other jackets on this list, even though they don’t have a dedicated heating element in the pocket area. The Makita DCJ200 is a good example because the slightly lower positioning of the chest heating elements helps to spread heat through to the pocket area. Should I get a hoodie or a jacket? It really comes down to a matter of personal preference. I have one of each and love them for different circumstances. Think about what kind of activities you might want to be doing when wearing your heated jacket or hoodie. One or the other may be more conducive to that activity. I’d generally recommend going with a jacket for more active outdoor activities. Then again, you can always put on a regular winter jacket on top of your heated hoodie. That might be the warmest solution of all. The batteries used in these jackets or hoodies will come with special chargers. For many of the jackets on this list, both the battery and charger come with the jacket. In some cases, you’ll need to purchase these separately. In every case, it’s a pretty straightforward process to charge the battery. It just involves placing the battery into the charger and plugging the charger in. It may take at least a few hours to fully charge the battery. It’s a good idea to purchase a spare battery for those days you know you’ll be out in the cold for a long period of time, like when hunting. Can I bring this on an airplane? It’s natural to wonder if a heated jacket might set off alarm bells at airport security. Heated jackets are on the TSA list of allowable items, along with things like electric heating pads. However, it has certainly happened at least a few times that the TSA thought a heated jacket was a bomb. If you’re concerned about this, you might want to check your jacket. Or when going through security, just make sure to explain to them upfront about your jacket. Who knows, they’ll probably be jealous and end up buying one for themselves! Which one do you recommend for skiing? For skiing or any other kind of vigorous outdoor activity, you want a jacket that can handle a lot of movement. Most of the jackets on this list offer good mobility. 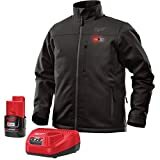 For men, I’d recommend the Milwaukee M12 Heated Jacket or the Dewalt DCHJ060C1 Heated Jacket. For women, I’d recommend the Dewalt DCHJ060C1 Heated Jacket. Another option is to wear the Ororo Heated Down Vest underneath your normal ski jacket. This kind of layering is a good option anyway since you might end up heating up throughout the day as you exert more energy on the slopes. Is it safe to use on a motorcycle? Yes, a heated jacket is perfectly safe for use on a motorcycle. A heated jacket could certainly help make a ride on cold day more comfortable and enjoyable. A heated jacket is the kind of thing you can’t imagine your life without once you try it. I know it really improved my life. Spending time outside in the cold is just so much more enjoyable when you’re not fully freezing. Any of the heated jackets, hoodies, and vests on this list are good options. When making this list, I considered what I think are the most important factors in a heated jacket: value, comfort, style, durability, heat functionality, and special features. Which of these factors is most important to you? There is definitely a jacket on this list for everyone. Just think about what matters most to you. Have you ever worn a heated jacket? Heavenly, right? What did you think? Do you have a favorite heated jacket that’s not on the list? Let me know in the comments. But it seems like the world just caters to smaller people. Big people have money to spend also.